Our guide will walk you through each step of the application process. We explain how to make your resume stand out, and how to find firefighting jobs around the country. You are walked through each step of the process. The firefighter entrance test is extremely competitive. How you study will make a difference. Our guide shows you how to study each subject that will be on the test. We walk you through creating a study plan, overcoming test anxiety, and even strategies for the day of the test. First we walk you through what the exam is like, covering each of the topics that are most commonly tested in the United States. We provide time management stategies, and test taking tips such as “when to guess and when not to guess”. This chapter prepares you for the sample firefighter entrance exam that comes later in the book. Firefighting is a physically demanding career, and departments will administer a test to be sure you’re capable of performing the duties of a firefighter. Our firefighter exam preparation book covers the most commonly tested events for a firefighter physical ability test. We cover tests that are common across the United States such as the CPAT. This guide will walk you through each event, provide strategies on how to pass each one, and give you training suggestions. 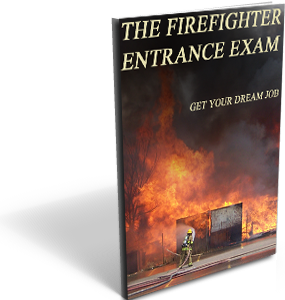 Our firefighter entrance exam ebook explains what the medical and psychological exams consist of. The explain the best strategies for passing the tests. 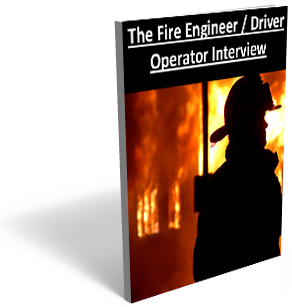 The oral interview is one of the most difficult parts of the firefighter hiring process. Most candidates are eliminated at this step of the process. Our guide tells you what the interview is like and gives you tips for preparing. We explain the most common mistakes firefighter candidates make in interviews and how to avoid them. We also provide information how you should dress. 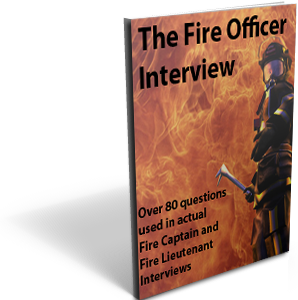 Our guide provides 40 firefighter entrance interview questions, including very important situational questions. The firefighter entrance exam is competitive and demanding. Preparation is the key to your success. 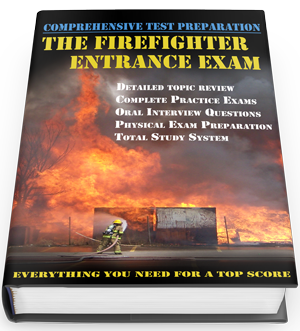 Our firefighter entrance exam ebook will prepare you for a top score. Purchase this ebook now with PAYPAL for $19.99 and download instantly. The book was comprehensive about the application and what was on the written test. I take my entry exam in 2 weeks. The sample test showed me how rusty I was at math and memory recall. Very pleased with my purchase! Lots of reading here, very detailed info on the written test and physical test. The interview questions are the best part of this ebook in my opinion. Solid read. I was totally unprepared for the memory recall. This is a good read and told me a lot about the hiring process. I am pretty nervous in interviews but felt very comfortable with all the practice questions. I am taking two tests in the next month so hopefully will have some success. I’m very happy with this book, I spent twice this amount at barne’s and noble on another book that wasn’t nearly this quality. Good book. Fantastic ebook. Very pleased with the purchase, lots of detailed information. I was most impressed with the detail of the process and the practice test. Good book, top notch customer service. Pretty simple. Better than the test prep book I ordered off Amazon. Very detailed. Detailed book and lots of questions. I was very pleased with the purchase. I have been taking entrance exams for the last 3 years. I purchased two books from Amazon on the fire department entrance exam. I purchased this guide and was very pleased. Its detailed but also direct and to the point. It helped me work on my math skills and interview skills. I am pleased to say that I just got hired at a small department in California. I was very pleased with this guide, especially the interview questions. This guide is easy to study and very detailed. Lots of information about each of the testing areas. The interview questions were a huge help for me. Very pleased with this book. Great prep tool, I am studying it now in hopes of getting hired after my next test for a couple of departments. I’ve tested with 3 departments and made the A band with all 3 after buying this book. The interview questions were especially helpful for me. I GOT HIRED !!! Thanks so much for the book. I finally have my dream job. The interview questions were the most helpful for me. I am now in my recruit class and having a blast. Great purchase! Excellent book and excellent prep system. The practice test was veyr helpful. I’ve purchased several books from amazon and honestly this was my favorite. It gets straight to the point and really helped me with my interview. Very helpful guide. The math section really showed me where I was weak. The interview questions were great. I had a raw score of 95 on my entrance exam after studying this book. I also have the barrons book, and the learning express book. They are ok but I was very pleased with this book. The interview questions are much more detailed than any others I have studied. I have been trying to get hired as a firefighter for a few years now. I bought this book and studied for about 2 months. I recently tested with a department in Texas and got hired. Got the guide, and got hired last week. Its a good guide that really explains the process. This was a great guide that explains each step of the hiring process. My entrance exam had roughly 200 people in it. I scored a 95 and got hired in the first wave. I am very pleased with the guide and my new job. Its a very good guide for the firefighter entrance exam. I had never taken this test before and had no idea what to expect. This book was thorough and had a ton of sample questions. Man the competition for these jobs is FIERCE! I have taken 4 exams in CA and all have had over 500 applicants. I bought this guide and kept studying. I just received a letter informing me that I am number 9 on my latest test. That should be high enough to get me hired! Fantastic guide. It showed me that I was really weak on my math skills. I have since been working on them and my interview skills. Great book. Really a good guide with a lot of info. The interview questions helped me prepare more than anything else. Fantastic ebook. It really helped me with the interview. I’ve bought a couple of these and honestly this was the easiest to understand and use. Fantastic way to study to become a firefighter. I tested with several departments and never made it to the top 10. I bought this guide and a Barrons guide off amazon. This guide smoked Barrons. Its much easier to study from and I liked the test much better. Great product. Very pleased with the book, loved the interview section. This job is so hard to get, everyone in the top 10 is smart and has a stacked resume. This guide helped me score number 1 on one list and number 3 on another. I hope to get a call anyday. The math section helped me out immensely. Really helpful way to prepare for the firefighter entrance exam. Fantastic way to prep for the written and physical. Excellent explanation of the oral interview and lots of sample interview questions and help. It got me hired after failing 3 other tests. What more can I say. Its really competitive out there, this book helped me out a lot. I purchased this book after leaving a department and taking tests in another state. Competition if ferocious! This was a great refresher and he comes highly recommended. Great study aid. Anything that gives you an edge in the test or interview is worth it. I have been very close at three different departments and just couldn’t seem to get hired. This book gave me a ton of interview practice and helped me really have a solid interview. Very pleased. By far the best way to prepare for the job there is. Excellent book that did a really good job prepping me for my test and interview. I ended up getting hired with a department in Oregon. Thanks Jason. This is THE book to buy if you’re looking to get hired as a firefighter. By far the best study material I have used. I’ve read a few books and was very pleased with this one. Its detailed and easy to follow. Good all around prep work for the entrance exam. I was referred to this book by a friend who used it. It is by far the best book I have used to study for the entrance exam. Very pleased. This is the best way to study for a firefighter position bar none! I had the hardest time with the interview and this book really did a good job preparing me for it. Best firefighter study guide I have used. Very solid book with a ton of useful information. The practice tests were very accurate to real tests. This is a great resource for those seeking a job as a firefighter. One of the better firefighter entrance test books out there, very impressed with the depth of the explanations and the practice tests. I really enjoyed using this book. The practice test was good and the individual sections were nice. If you’re looking for a comprehensive way to study for a firefighter entrance test, this is it. It is written by firefighters, for firefighters. Best way to study for a job as a firefighter. I am an instructor for firefighter 1 and 2 courses. I purchased this book to assist me with some things in class. I wanted to help some students prep for a local firefighter written exam. I am thoroughly impressed with the depth of content, sample test, and overall quality. I will recommend it to anyone trying to get hired as a firefighter. Love the book and practice test. The memory recall section was helpful. I liked the math review. Jason was very helpful with assisting me in placing a copy of the book on my ipad and my phone. Thanks again. I bought this book several years ago and after a mess with my EMT didn’t get to test. I tested last month and did great. The reason I decided to comment was because of the customer service. I emailed Jason and told him my book was 2 years old. He sent me a new version for free! Can’t say enough about the customer service. Very good prep tool, lots of study tools and ideas. I had an easier time with this than the barrons book. My dream was to become a firefighter but I kept performing poorly in the interview, this book really helped me to work on my interview skills. I really did well in my interview for wash fire and got hired. Thanks! What a great book and great way to study. I was very pleased with the interview section, it was very helpful. This book really helped me prep for my test and interview. As the others said I really appreciated the math work and the interview prep. I was definitely rusty at math after 10 years out of school! What a great book. I haven’t done math problems since high school so this was a huge help for me. This was a great help for my test taking skills. It also gave me a lot of tips for the memory section of the test which I have traditionally struggled with. What a huge help this book was for my interview prep. I felt solid about testing but terrible about the interview. This book put me at ease definitely. If you want to get a job as a firefighter, this is the book that you need. It’s very detailed and very thorough. Great purchase. The biggest help for me in this book was the interview section and the memory recall section. Those were the areas I had struggled with the most in the past. Good book. Very pleased with the book. It had everything I needed to get on track and hired. Great book! It helped me immensely. The best part of this book was the review on the math and the instruction on the oral interview. Very happy with it and very helpful. I liked the book and the guys were very helpful. Excellent quality and a great book. Very happy with my purchase and I feel very prepared. Fantastic and informational book. It helped me to score in the A band and eventually get hired. I loved the book and the customer service.